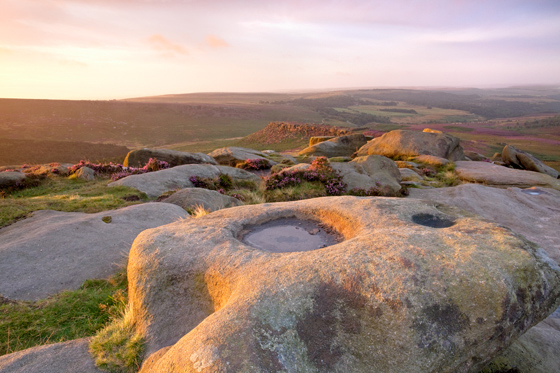 This workshop is a unique opportunity to photograph the wonderful Peak District in Autumn. The Peak District is an area of great natural beauty made up of rocky outcrops, peat covered moorland and wonderful limestone dales. The Varied landscape and changeable weather and light make this area a dream to photograph for the landscape photographer. The date for this workshop has been carefully chosen to capture the beauty of this landscape at autumn. Because of the time of year and the large number of fantastic woodland waterfalls we will have plenty of locations to photograph even if the weather is dull of any of the days. This workshop includes accommodation staying in single occupancy rooms in a self catering cottage in the heart of the Peak District. Numbers are strictly limited to between 4 – 6 participants to allow lots of time and tuition throughout the weekend and to be part of a really small group of other like minded photographers. The workshops are aimed at photographers with an interest in landscape photography however due to the nature of our location there may also be a chance to shoot a range of wildlife subjects found in the area. The workshops cater for all levels of experience from photographers with little or no experience to advanced photographers. By ensuring that group numbers are kept low ensures that there is lots of available time and tuition for individuals and the chance to be part of a small friendly group with other like minded photographers. Breakfast & snacks are included in the price, lunchtime and evening meals including drinks are at guest’s own cost, a typical evening or lunchtime meal for our planned locations usually costs under £15 & will be at a number of local pubs or restaurants for the various planned locations. Why self catering and small groups? In previous experience of running residential workshops the self catering ones always work the best. We have the freedom to get up and go as we please and we are not restricted to meal times, if the light is good we can keep on shooting safe in the knowledge we don’t have to be back at a hotel in time for breakfast or dinner. The great thing about group workshops is that participants also learn from each other, as people are living closer together for the weekend they always build up a really close bond and friendship. The majority of previous group self catering workshops the participants have all stayed in touch and become good friends even after the workshop has finished and in fact some still meet up for photography shoots several years after their original workshop together. I know everyone has completely different tastes in food and for this reason we stop off at a local pub for our lunch and evening meals where guests are free to order what they like. Breakfast is provided in the cost where we will have a good selection of cereals, fruit, croissants, juices, toast, scones and jams. Evening meals and lunch are at participants own costs. This workshop is strictly limited in numbers of between 4 – 6 participants to allow lots of one to one time & tuition throughout the course and to be part of a small friendly group. Three night workshops begin on Friday afternoons and finish at 10:00 AM on Monday mornings. All workshops are strictly limited in numbers so early booking is advisable. A non refundable deposit of £150 is required to secure your place on this workshop any remaining balance is then due eight weeks before the workshop date or at the time of booking if sooner than eight weeks. To book your place on this unique opportunity please please use the checkout option below and a booking form will be sent out at a later date. Or alternatively please contact the office for a booking form to complete along with your deposit or full payment. Breakfast and snacks are included, drinks, lunch and evening meals are at participants own cost. To book a place on this workshop please click the buy it now option below to pay a £150 deposit, payment can be made online or you can send a cheque in the post. During Checkout Please type in the workshop date you require and any other instructions (such as if you would like a gift certificate) in the Order Notes box.